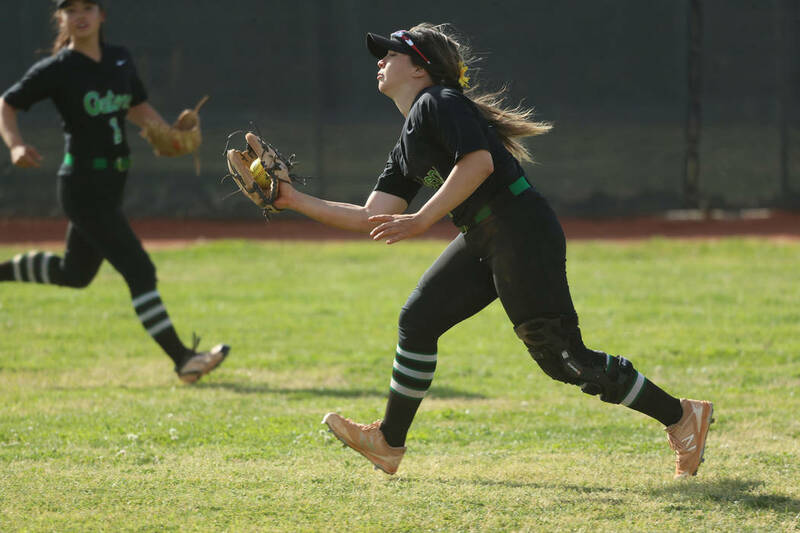 Tiffany Katz spun a two-hitter with three walks and three walks on Friday to guide host Green Valley’s softball team to a 3-0 win over Foothill. Cindy Martinez-Escamilla was 1-for-3 with an RBI, and Alyssa Vigil was 1-for-2 with a run for the Gators, who scored one run each in the third, fourth and fifth innings. Foothill’s Leah Becker tossed a three-hitter. She walked one and struck out three. 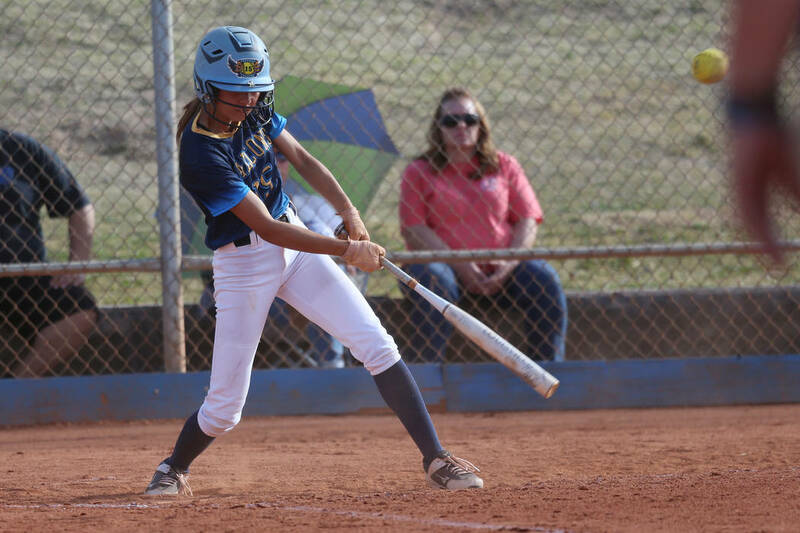 Sierra Vista 17, Moapa Valley 16 — At Sierra Vista, Jessica Schneider was 2-for-5 with a triple and five RBIs to help the Mountain Lions outlast the Pirates. 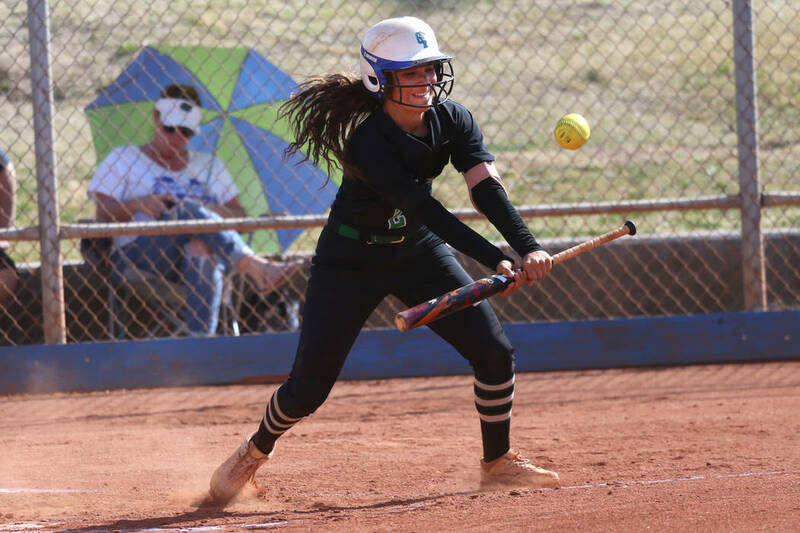 Mia Buranamontri went 3-for-5 with a double and three RBIs, and Ryan Watkins was 1-for-1 with a home run, two RBIs and four runs for Sierra Vista, which led 16-10 after five innings. 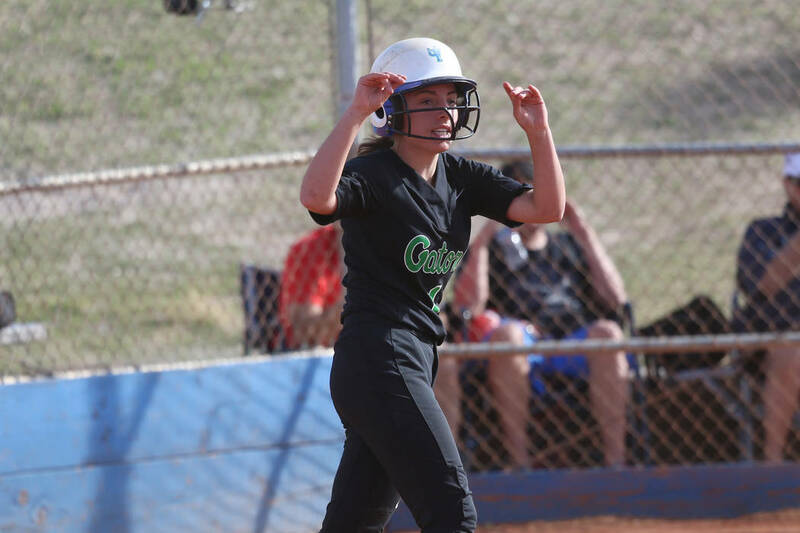 Abbie Evans was 3-for-5 with three doubles and five RBIs, and Sierra Staheli was 3-for-5 with a triple, a double and five RBIs for Moapa Valley. Lainey Cornwall was 3-for-4 with a double and two RBIs for the Pirates. Arbor View 11, Rancho 1 — At Arbor View, Roxanne Ines was 3-for-4 with a home run, a triple, a double and four RBIs as the fifth-ranked Aggies handed the third-ranked Rams their first loss of the season. Trinity Brandon was 2-for-3 with a home run and two RBIs, and Hannah Hickstein was 2-for-3 with an RBI for Arbor View. Annie Finch tossed a six-inning five-hitter and struck out nine for the Aggies. MacKenzie Perry was 2-for-3 for Rancho. 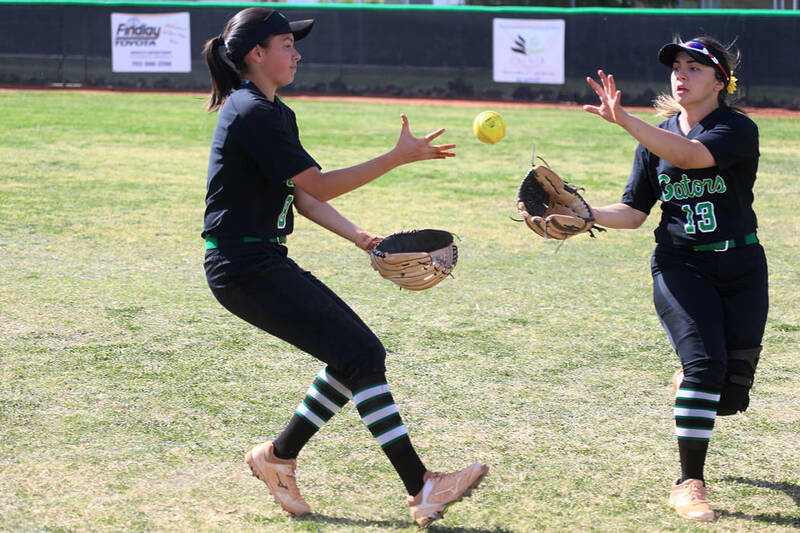 Cimarron-Memorial 13, Las Vegas 1 — At Las Vegas High, Tiarra Del Rosario and Reagan Wadsworth each went 3-for-4 with a double to guide the Spartans by the Wildcats in five innings. Jordyn Ramos was 2-for-3 with two RBIs for Cimarron, which scored nine runs in the first inning. Kaitlyn Horstdaniel went 3-for-3 with a double for Las Vegas. Eldorado 13, Desert Pines 0 — At Eldorado, Adriana Romero tossed a five-inning two-hitter with 10 strikeouts and went 3-for-3 with a triple and two RBIs to lead the Sundevils by the Jaguars. Harlee Salazar was 3-for-3 with two runs and an RBI, and Julia Guerra, Veronica Velasquez, Roshanda Stevens and Kandace Parker all went 2-for-3 for Eldorado. Centennial 16, Canyon Springs 0 — At Canyon Springs, Deanna Barrera threw a three-inning perfect game with eight strikeouts as the Bulldogs routed the Pioneers. Kaylee Pierce was 3-for-3 with a double and two runs, and Maddie Kallfelz was 2-for-2 with a triple and two RBIs for Centennial. Ashley Maltman was 2-for-2 with two RBIs, and Madeline Wade went 2-for-3 with two RBIs for the Bulldogs, who also got two hits from Ryan Rogers. 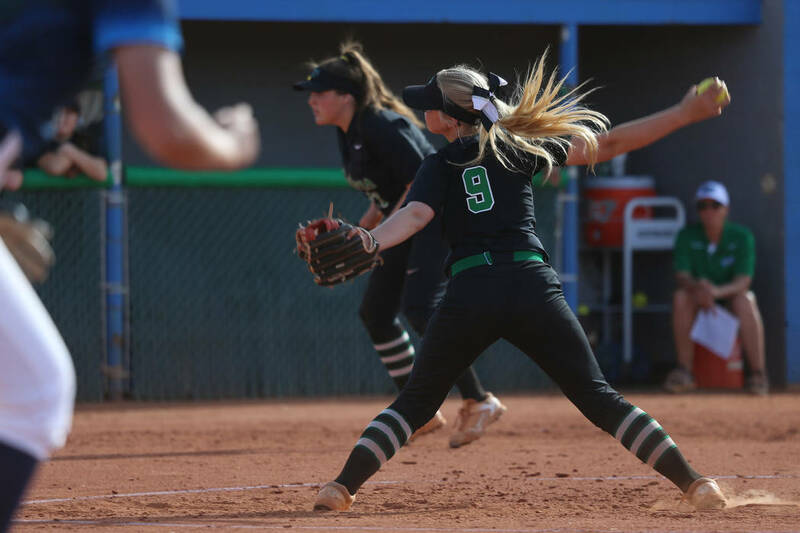 Shadow Ridge 19, Cheyenne 0 — At Cheyenne, Jasmine Martin tossed a three-inning perfect game with eight strikeouts and was 2-for-3 with a grand slam and a double to lead the Mustangs by the Desert Shields. 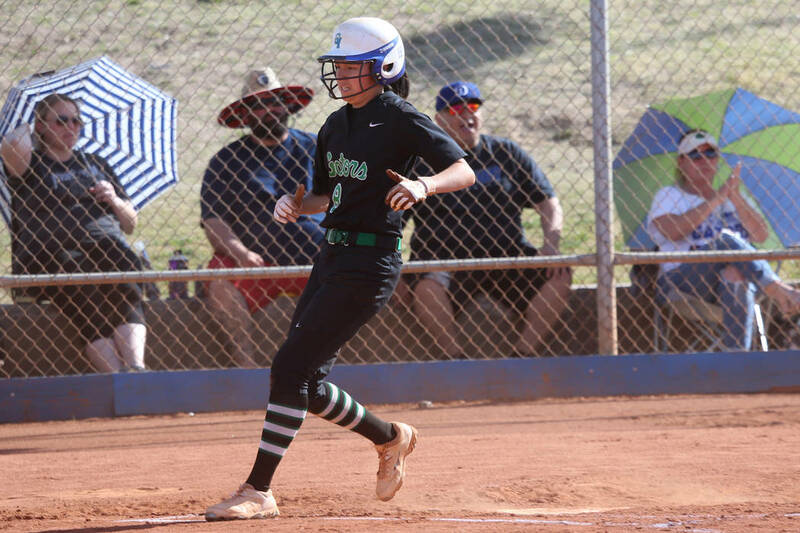 Angelina Esqueda was 2-for-3 with a home run and four RBIs, and Alyssa Stanley, Caitlin Covington and Hailey Morrow also homered for Shadow Ridge. Pahrump Valley 12, Mojave 1 — At Pahrump, Deanna Egan hit a home run and had two RBIs as the Trojans rolled past the Rattlers in five innings. Jacquellen Stobbe also hit a triple and had two RBIs for Pahrump. Natalie Waugh-Magana spun a three-hitter for the Trojans. 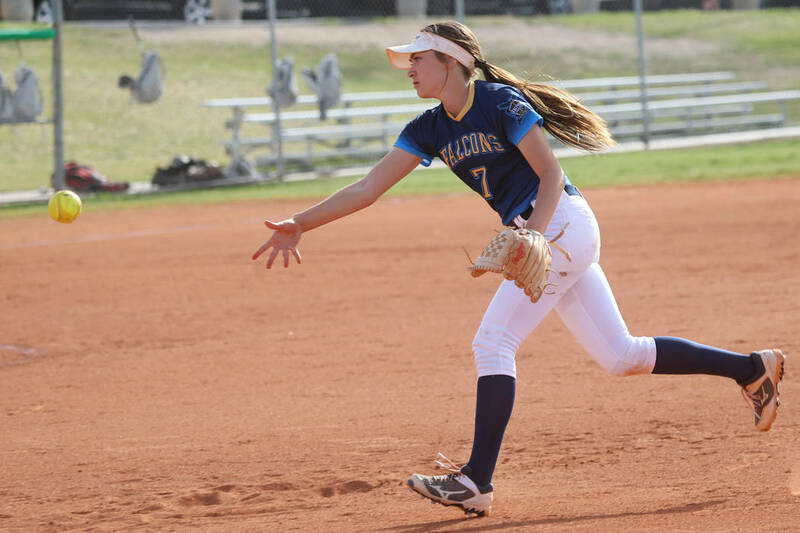 Del Sol 22, Western 7 — At Del Sol, Stephanie Tewart was 3-for-4 with four runs and four RBIs, and Sierra Rivera went 2-for-4 with three runs and four RBIs to help the Dragons to a four-inning win over the Warriors. Kyra Fagota was 3-for-4 with an RBI for Del Sol. Brenna Rivera went 2-for-3 with a triple and four RBIs for Western. Valley 22, Democracy Prep 7 — At Doolittle Park, Ariana Simmons was 3-for-4 with three runs and four RBIs as the Vikings routed the Blue Knights. Heather Robinson was 2-for-4 with three runs and three RBIs for Valley, which scored 17 runs in the second inning. 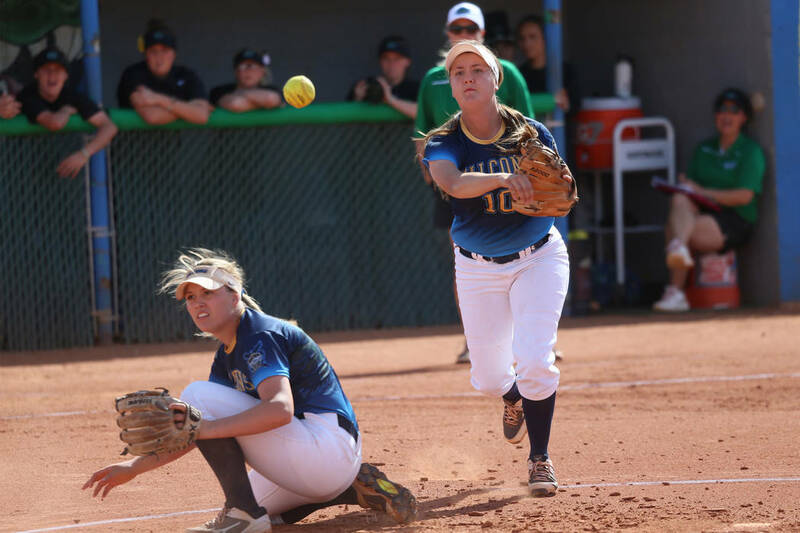 Bishop Gorman 12, Rosary (Calif.) 4 — At Anaheim, California, Ashley Kuckler went 3-for-3 with a triple, two runs and two RBIs as the Gaels downed the Royals in the Savanna Rebels Tournament. Nycole Cootes and Hayley Coreas each added two hits for Gorman. 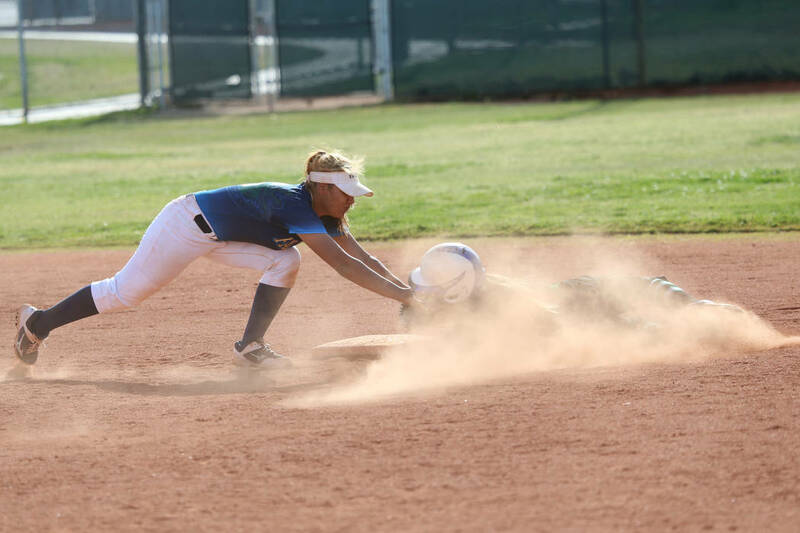 Bishop Gorman 13, Savanna (Calif.) 3 — At Anaheim, California, Katelyn Hunter had two hits, including a home run, to lead the Gaels by the Rebels in the Savanna Rebels Tournament. Olivia Bailey doubled and singled, and Coreas had two hits for Gorman. 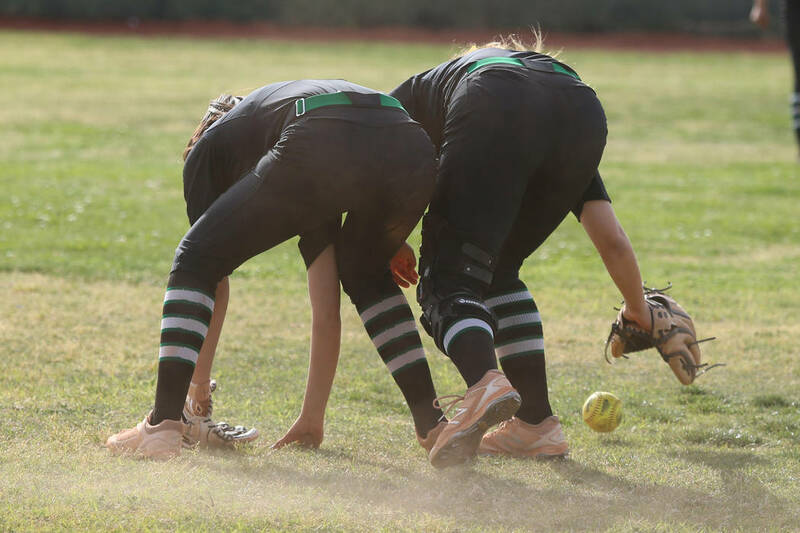 The Meadows 20-26, Mountain View 0-11 — At Mountain View, Alexis Peltzer-Harding drove in two runs in the opener and had five RBIs in the nightcap as the Mustangs won two three-inning games over the Saints. In the opener, Mercedes Moore was 1-for-3 with three RBIs for The Meadows, which drew 17 walks. Moore was 2-for-2 with a double and three RBIs, and Arianna Jones was 3-for-3 with two RBIs in the second game for The Meadows. Keyla Aguilar, Valerie Gonzalez and Kaitlyn Schoeb each had two hits in the second game for Mountain View. 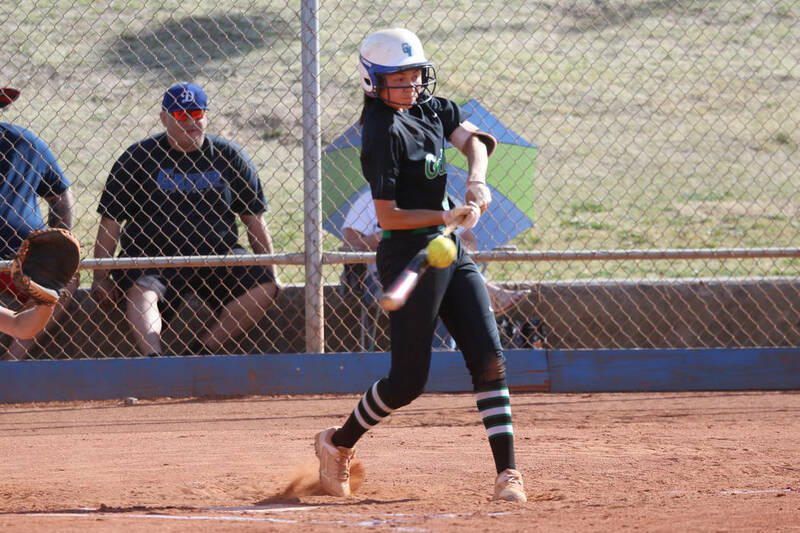 Pahranagat Valley 22-20, Beaver Dam 3-3 — At Littlefield, Arizona, Morgan Harris was 3-for-4 with two triples, a double, four runs and two RBIs in the nightcap as the Panthers swept two three-inning games from the Diamondbacks. Rebecca Taylor was 3-for-4 with three RBIs, and Kami Stirling was 2-for-2 with a double and two RBIs for Pahranagat Valley in the opener. In the second game, Hannah Castleton was 2-for-3 with a triple, a double and three RBIs, and Taylor Higbee was 2-for-3 with three RBIs for the Panthers. 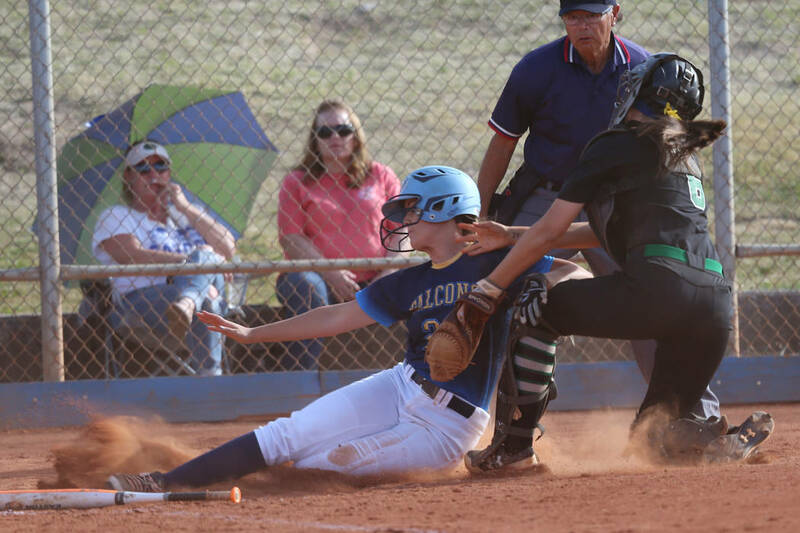 Indian Springs 17-16, Sandy Valley 1-1 — At Indian Springs, Mariea Torneskog was 1-for-2 with a triple and two RBIs in the opener and 1-for-2 with a triple and an RBI in the nightcap as the Thunderbirds swept a pair of three-inning games from the Sidewinders. Brooke Karl went 3-for-3 with a triple, a double and three RBIs, and Kamryn Perry was 3-for-3 with two RBIs for Indian Springs in the first game. In the second game, the Thunderbirds had just three hits but took advantage of 14 walks and four hit batters. Lincoln County 14-12, Lake Mead 1-0 — At Panaca, the Lynx swept the Eagles. Laughlin 7-7, Calvary Chapel 0-0 — The Cougars won twice by forfeit against the Lions. The Bonanza at Spring Valley game was postponed when no umpires arrived for the game. A make-up date has not been set.